William Hill High 5 is a horse racing promotion for existing William Hill customers. If your horse wins a jumps race by 5 or more lengths, you get a 15% free bet bonus on winnings (not your stake) to £100. This offer is available on selected UK and Irish horse racing meetings each day. A race must have at least 6 runners to qualify for High 5. The bonus applies to bets placed on all selected races from 1730 hrs the day before the race starts. – Look for a clear favourite in a 6-10 runner race. – Find closely matched odds between William Hill and the exchange, then simply back and lay your selection. 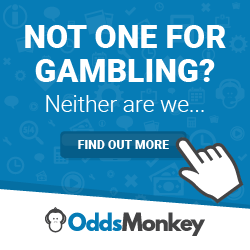 – Keep qualifying losses to a minimum, around £1 or less per £50 staked. – Do not back more than one horse in each race. This will help to avoid a quick gubbing. On Saturday 17 February 2018, Coney Island was the third favourite in a 7-runner race at Ascot. I bet £10 on Coney Island at 4/1 (5.00) with William Hill. The lay odds were exactly the same as the back odds, so I layed £10 on Coney Island at odds of 5.00 on Smarkets. Coney Island does not win – make a small qualifying loss of £0.20. No free bet gained. Coney Island wins by less than 5 lengths – small qualifying loss of £0.20. No free bet gained. If Coney Island wins by 5 lengths or more – qualifying loss of £0.20. Also qualified for a £6 free bet (15% of bet winnings). I used a £10 stake on Coney Island for illustrative purposes (Coney Island did not win this particular race). If you bet £20 at William Hill, your potential free bet is £12, or £15 free bet from a £25 stake and so on. On Monday 19th February 2018, four out of five possible races qualified for High 5 at the Carlisle meeting. The winning horses starting prices were between 13/8 (2.625) and 11/2 (6.50). the 13/8 winning horse yielded a £24.37 free bet (15% of £162.50 winnings equals £24.37). The 11/2 winner yielded an £82.50 free bet per £100 stake. Try not to hammer this offer too hard with big stakes. Also consider placing some mug bets on non High 5 races, which should make your account less likely to get gubbed. In summary, William Hill High 5 is an excellent reload. Combined with other horse racing promotions, there is a potential for regular profits. Selected races. Paid as a free bet. Singles only. 6+ runners. Max bonus £100. Free bet rules and terms apply.